Many of the business owners I work with are stressed out busy people. They spend all day dealing with customer queries, processing sales orders and above all answering emails. Let’s be honest, when you are your own boss it’s very easy to get distracted, becuase you you get to choose your own hours and you have no one telling you what you can or can’t do. No one will call you out when you take an extra long lunch or you go to the gym in the middle of afternoon, or when you spend time “marketing” (updating your Facebook status) instead of following up on prospects. But when you’re busy doing urgent stuff, it’s really difficult to grow your business because you simply don’t have the time. And to grow your business you need to work on the important things, becuase these are the things that will actually grow your business. So how do you find the time to worked on the important things? Focused time on stuff you must do will get you much bigger results. A must do list is similar to a “to do list”, but it contains only the things that take your business forward, rather than the day to day stuff. Although you do need to enjoy yourself, you do need to be aware of spending too much time on the things you like doing, but don’t actually grow your business. Updating your Facebook or Twitter status are probably good examples of this! When you’re starting out creating your must do list, always start with the stuff that grows your business, then the stuff you love doing. A weekly action list is two things. On the one hand it is a broad outline of the things you need to work on each week, showing the major peices of work that you need to complete which will grow your business; such as product creation or prospecting for new clients, and secondly it’s a list of all the things that you need to do on a weekly basis which will grow your business. For example, this might include strategic planning or checking your analytics data. Then make sure that you block out the appropriate time each week on your calendar to actually do these tasks. The itention isn’t that you spend more time working, it is to spend more focused working time. 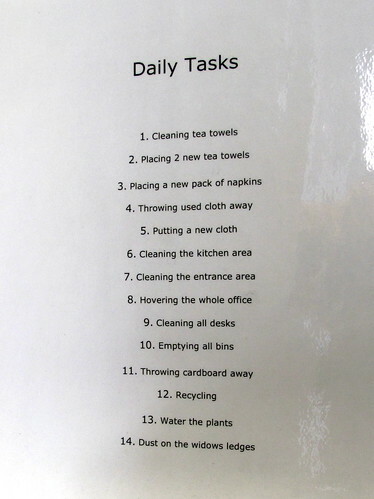 A daily action list on the other hand are the 3-4 items which grow your business that you need to do on a daily basis. This is not to be confused with your “to do” list. The daily action list typically won’t change that often, it’s essentially a collection of habits you need to complete on a daily basis which you should complete before you move on to your “to do” list. To start your daily action list, write down all the broad tasks that you need to complete on daily basis. When you start your work day, work on these tasks first. Once you’ve completed them you should move on to your “to do” list. If you find yourself checking Facebook for the number of “likes” your page has received 6 times a day, then maybe it’s time to stop this and focus on more important things on your action list. What separates the successful from the those that don’t achieve success is focusing on taking lots of small steps on a daily basis. Essentially this is getting up each day and powering through the each of the daily action lists tasks which will take your business forward. Being productive is just like exercise – you won’t see benefits overnight, but by doing it regularly you’ll form a habit and very soon you’ll start seeing big results. For example, if you currenty contact maybe 2 or 3 prospects a week, then after 3 months you’ll have contacted maybe 20 potential clients. If contacting prospects is on your daily action list, then after 3 months you’ll have contacted 60 potentials. Having 3 times as many prospects is going to have a significant impact on your bottom line.